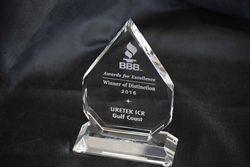 For the fifth consecutive time, Houston Better Business Bureau recognized URETEK ICR Gulf Coast for service excellence. In recognizing businesses and non-profits for their achievements and commitment to quality in the workplace, URETEK ICR Gulf Coast was one of 292 companies recognized at the annual Better Business Bureau Awards for Excellence on May 11, 2016. Recognized as a Winner of Distinction this was the fifth time to be recognized by the Better Business Bureau for service excellence. URETEK ICR Gulf Coast is a groundwork contractor that specializes in polyurethane injection foundation repair. They provide non-invasive solutions to lift unstable and subsiding foundations. URETEK ICR Gulf Coast serves residential and commercial markets in the Greater Houston Area.